Susan Gapka, a member of both CUPE National and CUPE Ontario Pink Triangle committees, has a new tool to open doors for people too often excluded: a Key to the City of Toronto. 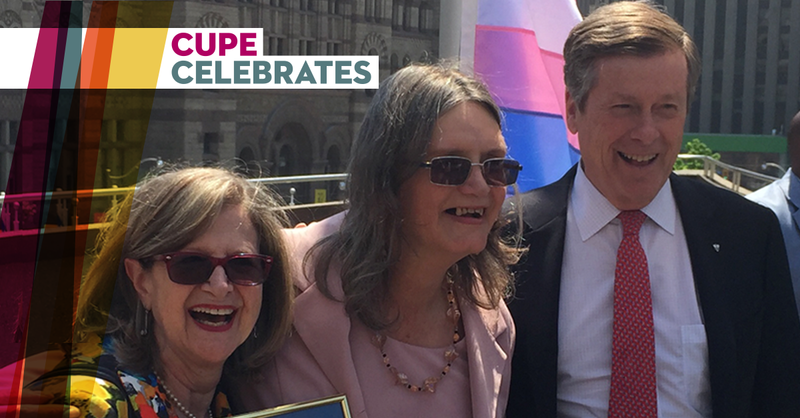 This week, Gapka was awarded the key by Toronto Mayor John Tory for her two decades of work on housing and homelessness, mental health and LGBTTQI issues – and transgender issues specifically. The “key” is a symbolic award, and a high honour. Cities bestow keys like this to recognize someone’s contributions to making them better. Gapka shared the honour with six other Torontonians this week. She is the first transgender person to be honoured in this way. Gapka is a member of CUPE 2998 and works as an educator and facilitator at The 519, a community organization at the heart of Toronto’s LGBTTQI community. Mayor Tory presided over the award ceremony at Toronto City Hall on May 17 to mark the International Day against Homophobia, Transphobia and Biphobia. The mayor called Gapka an “inspiration” and credited her with helping him understand more clearly the challenges facing transgender people. Tory praised Gapka’s tenacity and the role she has played for two decades as an advocate for gender-diverse people in their fight to access housing, health services and other supports. Gapka said the recognition was surprising and heartwarming. Gapka is proud of the role CUPE plays in helping workers fight austerity at the local level – and our union’s work to end poverty. It takes a village to change the world, she said, and CUPE is a big part of that effort, in Toronto and across the country.